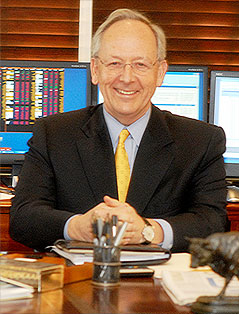 I recently came across two articles, one from 2011 and the other from 2012, where Chuck Akre from Akre Capital Management gives his view on MasterCard and Visa. In these articles Akre talks about how MasterCard and Visa both “principally own the ‘rails’ over which electronic payments travel worldwide.” Akre thinks both MasterCard and Visa are examples of great businesses. Emphasis in quotes and excerpts below are my own. Below is an excerpt from the interview in the AP article (see link below). “Q: Shares of Visa and MasterCard have risen sharply. Why do you continue to like these stocks for the long-term? A: These are extraordinary businesses. They have ‘toll booth’ models and operate in much the same way that Microsoft did when it became the dominant operating system for personal computers. As the PC market grew, Microsoft owned the operating system, and you were going to pay for it. Visa and MasterCard are the dominant players in what we might call the ‘rails’ over which electronic transactions take place worldwide, among the millions of merchants where their cards are accepted. Their customers on both ends are banks — those that issue cards to customers and banks for the merchants on the other end. It doesn’t make any difference whether it’s a card swipe or a payment made using a mobile device. Many of those transactions are going over the rails of MasterCard and Visa. There’s a lot of growth potential, because 85 percent of the world’s transactions involving an exchange of value are still done by cash or check. The 15 percent done electronically can only go up. It’s a phenomenon that will continue to grow worldwide. Q: Even with such potential, a company must execute well to generate strong profits. What do you think about MasterCard and Visa? A: It’s not unusual for them to post after-tax profit margins of greater than 30 percent for a given year. Compare that with the single-digit margins that are typical for American businesses. They are doing something unique that causes them to have such high returns on their capital. Q: Visa and MasterCard last month reached a transaction fee settlement that requires them along with some major banks to pay at least $6 billion to retailers. Some major retailers will be allowed to charge customers more if they pay using a credit card. Is that a risk for Visa and MasterCard? They could make less from transaction fees if some customers switch back to paying with cash or checks. A: If it works out the way the settlement has been agreed upon, MasterCard and Visa are both fully reserved for it, and it’s been accounted for in their earnings. (Note: For example, Visa increased its litigation provision by $4.1 billion for its recently ended fiscal third quarter, which led the company to post a loss of $1.8 billion.) But that won’t alter their broad outlooks. Q: Your fund doesn’t own any shares of American Express and Discover Financial Services. Why? Links to both of the articles mentioned above are provided below. Akre also talks about MasterCard and Visa in the third episode of the Value Investing Podcast, which can be found here. From reading the articles referred to above, MasterCard and Visa clearly looks like great businesses that I want to research to improve my understanding of the pros and cons of these owners of, at least for the moment highly profitable, electronic rails. I also included American Express below, since that business also looks like a great one. 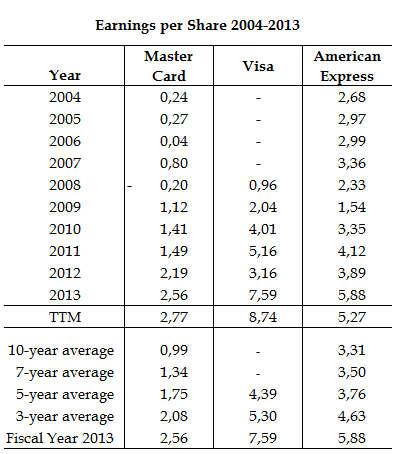 In the table below I have compiled earnings per share data for the ten-year period 2004-2013 (Source: Morningstar.com). 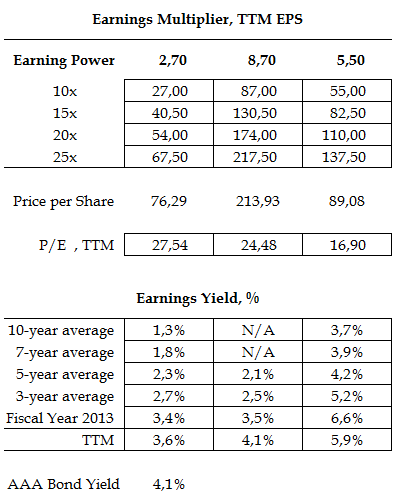 Also included are the trailing twelve month (TTM) earnings per share. At the moment, I have not looked in to any single year to see if there was any non-recurring income or expense affecting the reported earnings per share (see above and the MasterCard and Visa settlement). This will be done later on. Price per share data also taken from Morningstar.com per September 22, 2014. 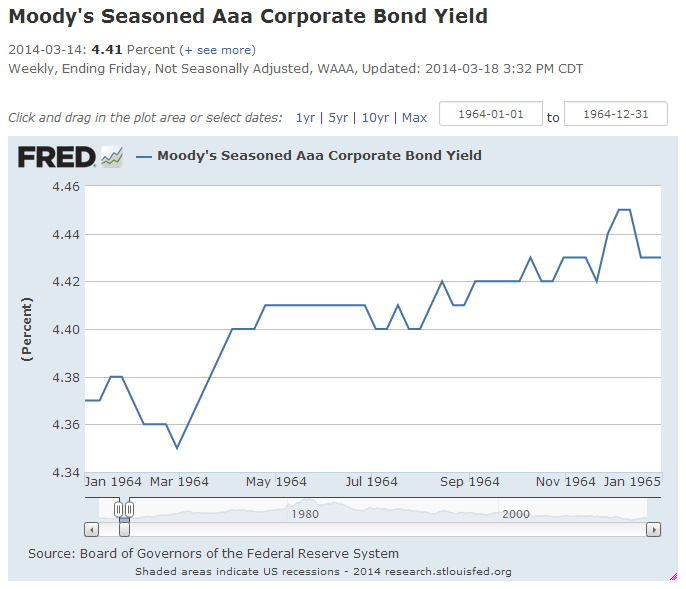 Bond yield data taken from FRED at the same date. Both MasterCard and Visa have shown great growth in earnings per share over the last couple of years. 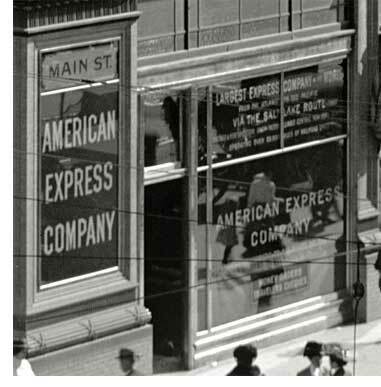 American Express has also posted good earnings per share numbers, doubling earnings per share in the last ten-year period. Without further digging into the earnings numbers for the moment, I have made a rough estimate of the earning power for each of the three businesses, see table below. 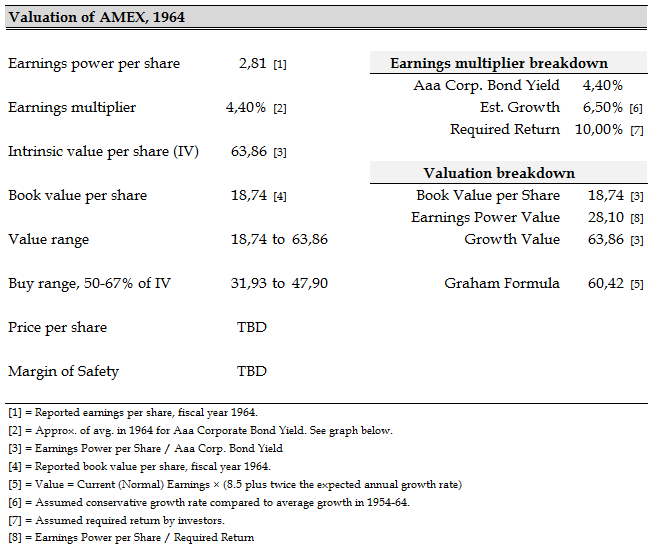 Different values based on a few earnings multipliers are provided in the table below. A reasonable earnings multiplier for each of the three businesses is likely in the range of 15 to 25 times. At the moment Master Card is trading at 27.5, Visa at 24.5, and American Express at 16.9 times TTM earnings per share, giving an earnings yield (TTM) of 3.6%, 4.1% and 5.9% respectively, compared to the AAA Bond yield that currently stands at 4.1%. If MasterCard and Visa are able to post high growth in the coming 5-7 years, the current market price looks justified. What about growth for American Express going forward? If we assume that future growth for American Express won’t be as high as for MasterCard and Visa, a reasonable value likely lies somewhere in the $80 to $110 range, probably in the mid to high end. A mid value in this range gives $95 per share. But, this is just a brief overview of all three companies. More research will be done to get a better grasp of the business fundamentals, the industry, competitors, profitability and what any significant risks might look like. Before this has been done, all of them will just stay on the watch list (see link below). To watch out for, and learn more about. MasterCard, Visa and American Express will be added to the watch watch list. Disclosure: I wrote this article myself, and it expresses my own opinions. I am not receiving compensation for it. I have no business relationship with any company or individual mentioned in this article. I have no positions in any stocks mentioned, and no plans to initiate any positions within the next 72 hours. This article is informational and is in my own personal opinion. Always do your own due diligence and contact a financial professional before executing any trades or investments. 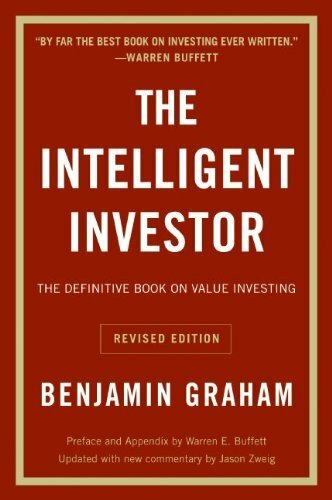 Below are my reflections and answers to the discussion questions posted at Modern Graham for chapter 8 – The Investor and Market Fluctuations – of the Intelligent Investor written by Benjamin Graham. But first a short note, before I go on to discuss the questions. So here it is, the much talked about “Chapter 8”. Read it, learn from it, and get back to it every now and then. “Let us close this section with something in the nature of a parable. Imagine that in some private business you own a small share that cost you $1,000. One of your partners, named Mr. Market, is very obliging indeed. Every day he tells you what he thinks your interest is worth and furthermore offers either to buy you out or to sell you an additional interest on that basis. Sometimes his idea of value appears plausible and justified by business developments and prospects as you know them. Often, on the other hand, Mr. Market lets his enthusiasm or his fears run away with him, and the value he proposes seems to you a little short of silly. 2. How have you seen the parable of Mr. Market play out in your experience? Any examples of a company that has been grossly mispriced at some point? One example that comes to mind at the moment is American Express (AXP) back in the financial crisis in 2008-09. Looking at the fundamentals of the business in the years before the financial crisis hit, it’s pretty clear that what we have here is a great business that faced some difficulties due to the financial crisis. The question was the severity of these problems. 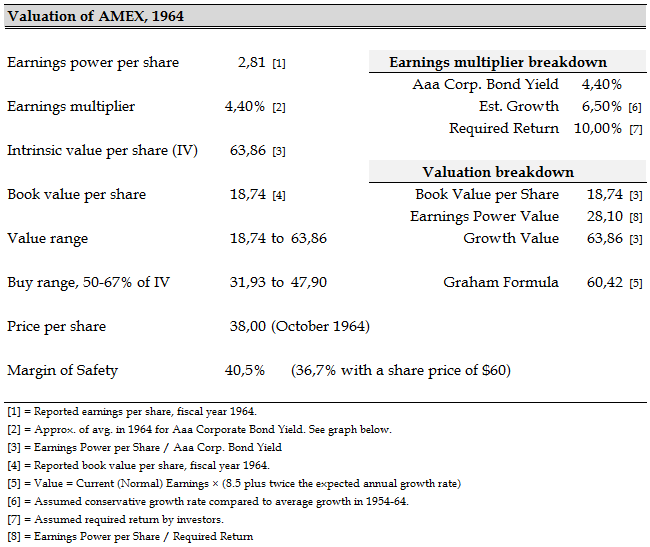 The AXP price per share, see below (Source: Morningstar), took a dive from $65 in April 2007 to $9.71 in June 2009, a fall of 85%. Having reached this low the share price started to climb up to where it’s trading today, at a price per share of $86, a gain of 686%. If I had had a better understanding of the business I might have had the courage to buy. 3. On page 192 Graham notes that as investing formulas have gained popularity their reliability dwindles due to new market conditions and the widespread use of the formula undermining its previously held advantage. In what ways has Graham’s formula lost reliability? How has it managed to stay useful? Graham’s formula is still of value. The formula focuses on businesses that has demonstrated an ability to grow earnings without taking on too much risk to do this. In the end, this is what counts, the value creation in a certain business. Then it’s all about paying a fair price for this value creation based on a reasonable and conservative assumption about the intrinsic business value. 4. Graham mentions that one issue with the formula plans is that they leave the potential for the market to “run away” from investors. What steps do you take to ensure that the market doesn’t run away from you, while also protecting yourself from a steep drop in prices such as the bear market of the early 2000s? Always be on the look out for great businesses selling at fair prices. The most important thing is to never pay too much for a business. 5. Graham seems to advocate that the Intelligent Investor find a way to have “something to do” as an outlet of pent-up energy as the market advances, rather than allowing oneself to become entangled with the market movements. Do you have any example of what you could do in that regard? Read about as many businesses as possible to prepare for less good times and for Mr. Market to offer some of them at a good price. The highlight of the chapter is the parable of Mr. Market. The final section “Fluctuations in bond prices” I read only briefly. Overall a great chapter.